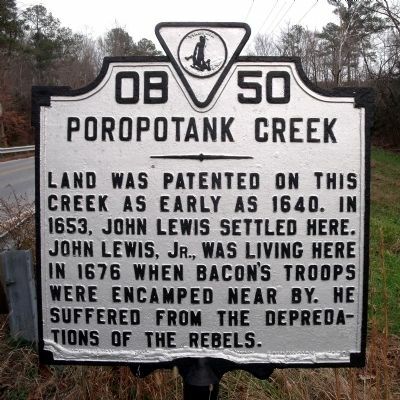 Land was patented on this creek as early as 1640. In 1653, John Lewis settled here. John Lewis, Jr., was living here in 1676 when Bacon's troops were encamped near by. He suffered from the depredations of the rebels. Location. 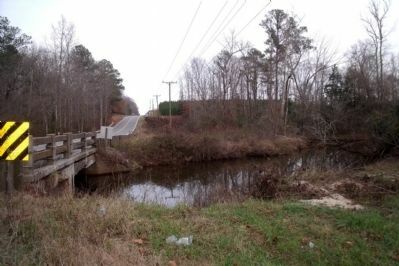 37° 30.002′ N, 76° 39.152′ W. Marker is near Saluda, Virginia, in King and Queen County. 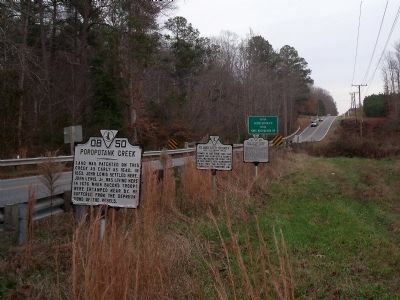 Marker is on Buena Vista Road (Virginia Route 14) half a mile east of Poropotank Drive, on the right when traveling east. Touch for map. Marker is in this post office area: Saluda VA 23149, United States of America. Touch for directions. (approx. 4.1 miles away); Marlfield (approx. 4½ miles away); Middlesex County / Gloucester County (approx. 6½ miles away); Bethel Baptist Church (approx. 6.7 miles away). Touch for a list and map of all markers in Saluda. More. Search the internet for Poropotank Creek. Credits. This page was last revised on June 16, 2016. This page originally submitted on December 8, 2009, by Bernard Fisher of Mechanicsville, Virginia. This page has been viewed 1,262 times since then and 15 times this year. Photos: 1, 2, 3. submitted on December 8, 2009, by Bernard Fisher of Mechanicsville, Virginia.